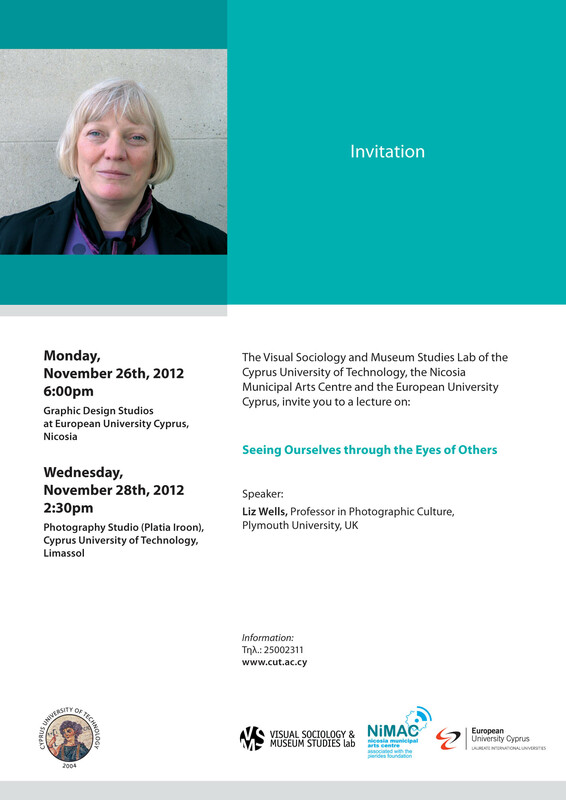 Lectures by Professor Liz Wells and photographer Nicos Philippou. 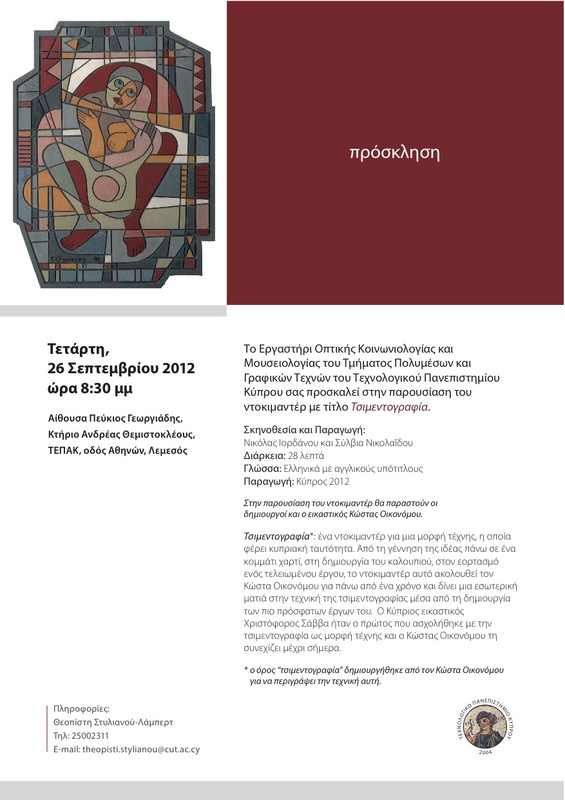 Mrs. Theopisti Stylianou (presentation title: Engendering a Landscape: the construction, promotion and consumption of the Rock of Aphrodite). The event was held on November 18th, 2016 (3.00 – 4.30 pm) at the Department of Sociology, University of Cyprus. 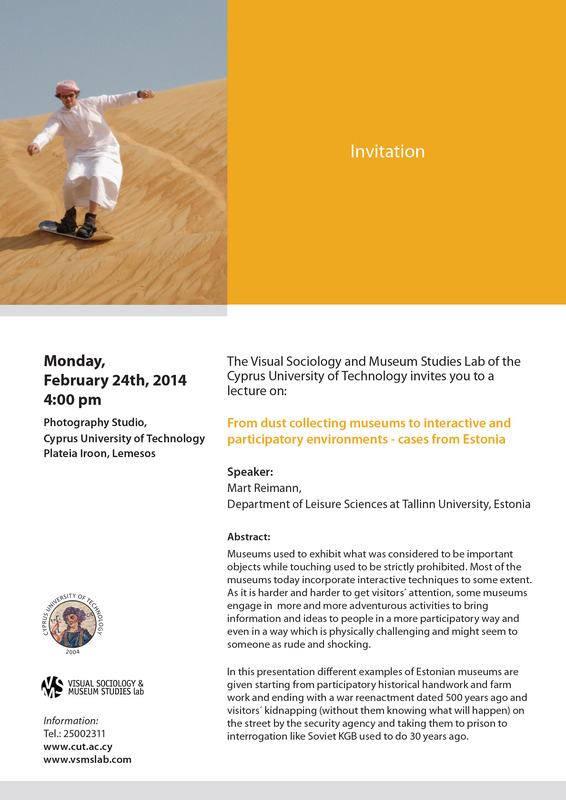 NeMe with the Visual Sociology and Museum Studies Lab and the Department of Communication and Internet Studies of the Cyprus University of Technology have launched an open call for participants from the arts, design, hacking, architecture, anthropology, technology, philosophy, and other disciplines. 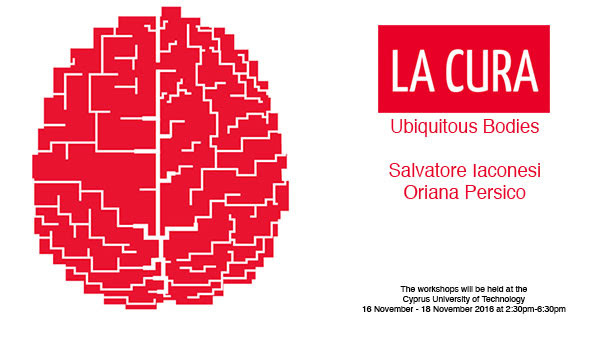 The workshops, La Cura: Ubiquitous Bodies was led by Salvatore Iaconesi and Oriana Persico. The results from the workshop was included in the exhibition nEUROsis at the NeMe Arts Centre (19/11/2016-18/12/2016) and a PoD publication by the Leonardo Electronic Almanac. Sciences and technology have enormous effects on the ways in which we perceive our body, our interconnectedness with the rest of the world – whether human or non-human -, our health and well-being. LaCura is an open, participatory performance whose aim is to create a social space which links technologies and networks, but also proximity, solidarity and human relations. When he was diagnosed with a brain cancer in 2012, Salvatore Iaconesi launched La Cura, a global performance, uniting arts, sciences, technologies, design and the whole of society to reframe the meaning of he word “cure”. Going beyond the biopolitics of medicine, data, bureaucracy and administration, the cure was taken back into society, confronting with the world’s complexity and diversity to create a collaborative cure in which everyone has a role and solutions come from the interconnection of approaches, sensibilities, techniques, disciplines, practices, strategies and tactics. 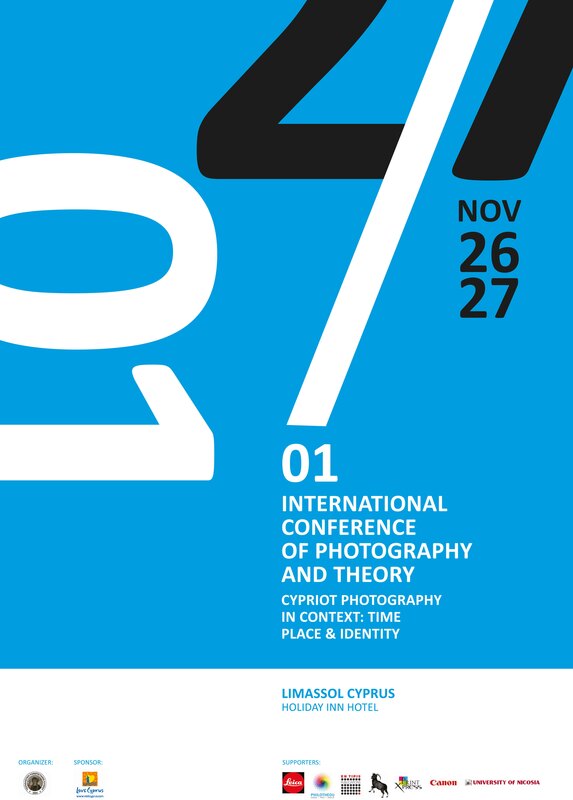 The workshops took place at the Cyprus University of Technology in Limassol from 16 November – 18 November 2016 at 2:30pm-6:30pm. He currently teaches Interaction Design and cross-media practices at the Faculty of Architecture of the “LaSapienza” University of Rome, at ISIA Design Florence, at the Rome University of Fine Arts and at the IEDDesign institute. He produced videogames, artificial intelligences, expert systems dedicated to business and scientific research, entertainment systems, mobile ecosystems, interactive architectures, cross-medial publications, augmented reality systems, and experiences and applications dedicated to providing products, services and practices to human beings all over the world, enabled by technologies, networks and new metaphors of interactions, across cultures and languages. His artworks and performances have been featured worldwide at festivals and conferences. Oriana Persico holds a degree in Communication Sciences and is an expert in participatory policies and digital inclusion. She is an artist and writer. She has worked together with national governments and the European Union to the creation of best practices, standards and researches in the areas of digital rights, social and technological innovation, Digital Business Ecosystems (DBE), practices for participation and knowledge sharing. Oriana writes critical, scientific, philosophical and poetical texts that connects to technological innovation, and on its cultural, sociological, economic and political impacts. She is an expert on the formal analysis of cultural and social trends, with specific focus on social networks. She creates breakthrough communication campaigns, performances, research methodologies and strategies. 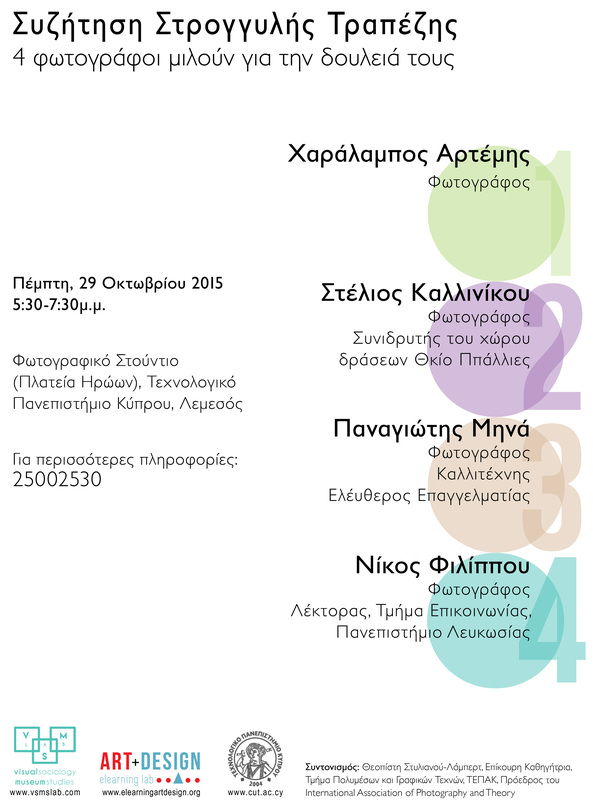 Cyprus Ministry of Education and Culture, Medochemie, Limassol Coop bank, Limassol Municipality, Meliton farm. 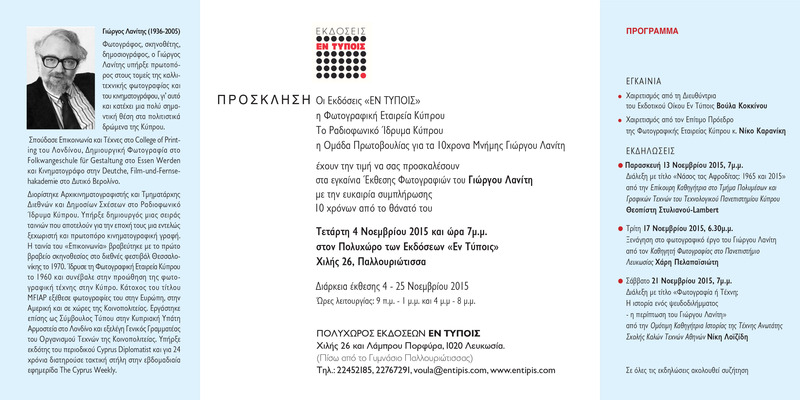 This seminar examines the narratives put forward by Cypriot museums and how these influence collective memory and identity. 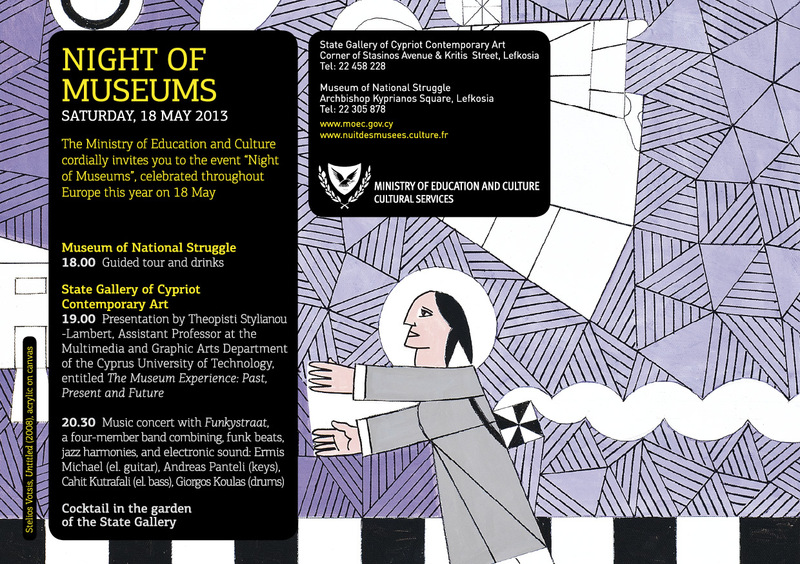 It also examines the roles Cypriot museums currently play in society and the roles they could potentially play as agents of social change. 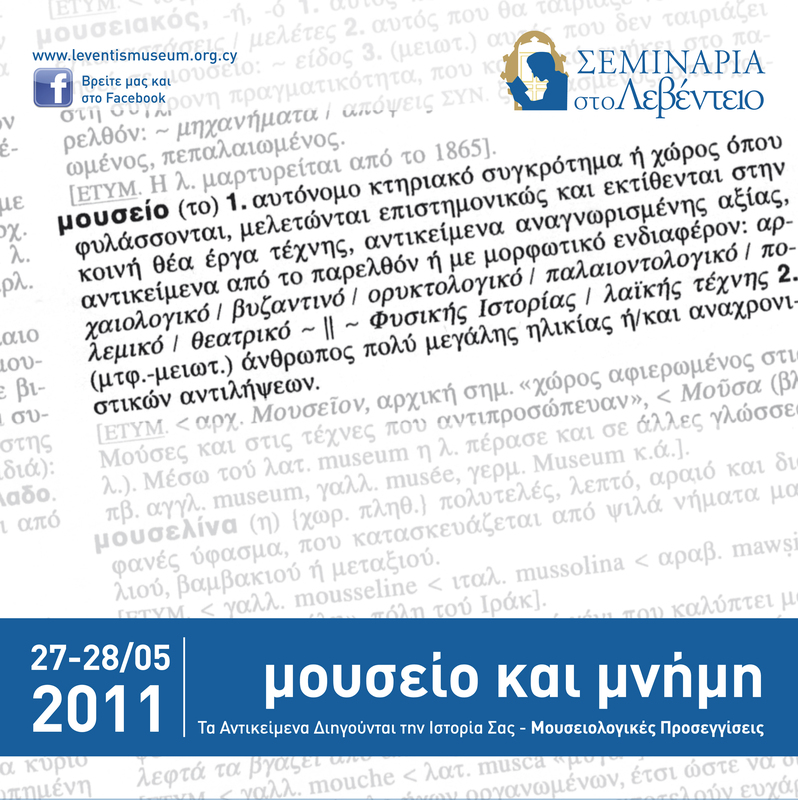 At the night of the seminar, the book “The Political Museum: Power, Conflict and Identity in Cyprus” was launched. World Museum Day. Presentations by 5 designers. Η δράση αυτή πραγματοποιήθηκε στο φωτογραφείο «Φώτο Μύκης», το οποίο βρίσκεται στο ιστορικό Κέντρο Λευκωσίας, απέναντι από την Ιερά Αρχιεπισκοπή. Αν και εκτός λειτουργίας, το φωτογραφείο περιέχει ένα τεράστιο αριθμό φωτογραφιών των τελευταίων δεκαετιών. Η δράση είχε διάρκεια μιας μέρας και αφορά ουσιαστικά την ενεργοποίηση του κλειστού φωτογραφείου «Φώτο Μύκης», παρέχοντας στους επισκέπτες την ευκαιρία να περιεργαστούν το περιεχόμενο του χώρου καθώς και την ευκαιρία να επεξεργαστούν το αρχείο του φωτό Μύκης και να παρακολουθήσουν ένα μικρό ντοκιμαντέρ. Μια συνεργασία της Faneromenis 70 με το VSMSlab. Παρασκευή, 13 Νοεμβρίου, 2015, 7μ.μ. Δευτέρα, 16 Νοεμβρίου, 2015, 3:00-6:00 μ.μ. 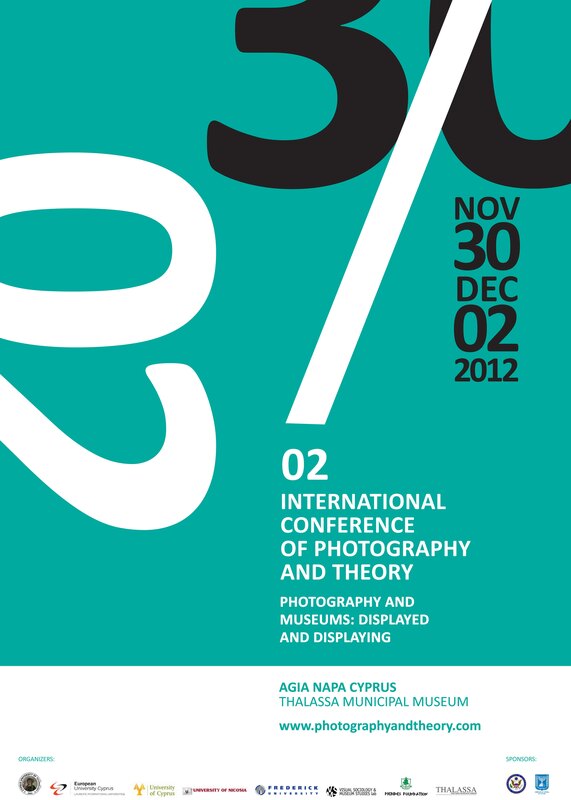 Co-organizer, 3rd International Conference of Photography and Theory – a conference organized by the Nicosia Municipal Arts Centre, Cyprus University of Technology/VSMS Lab, University of Nicosia, European University and Frederick University. Η ημερίδα παρουσίασε τα αποτελέσματα της έρευνας «Κυπριακά Μουσεία: Προκλήσεις και Ευκαιρίες» που ανέλαβε το Εργαστήριο Οπτικής Κοινωνιολογίας και Μουσειολογίας. Επίσης, έγινε μια εισήγηση για τη δημιουργία ενός ανεξάρτητου συνδέσμου Κυπριακών μουσείων και άρχισε ένας διάλογος γύρω από θέματα που απασχολούν τα μουσεία και πολιτιστικά ιδρύματα της Κύπρου. 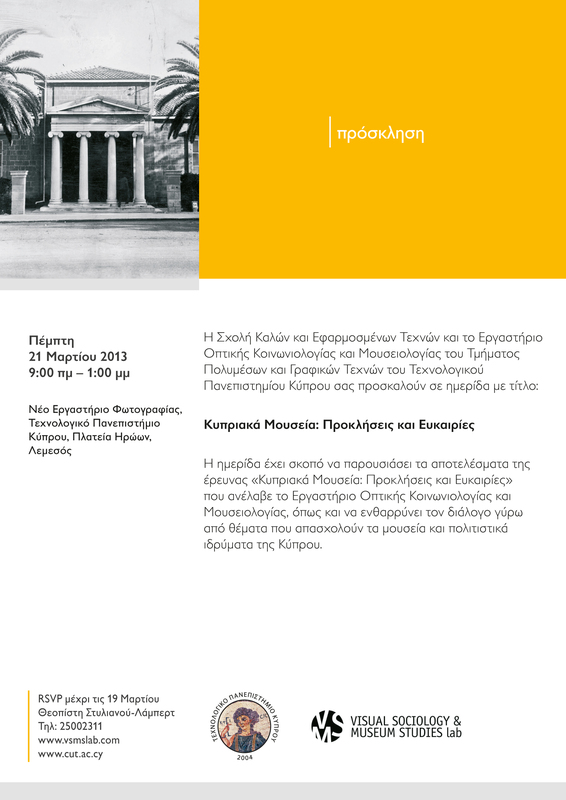 Lecture by Andreas Chatsilouka with title «The Challenge of Reviving the Costas Argyrou Museum.